Supramolecular chemistry deals with the organisation of molecules into defined assemblies using non-covalent interactions, including weaker and reversible interactions such as hydrogen bonds, and metal-ligand interactions. The aspect of stereochemistry within such chemical architectures, and in particular chirality, is of special interest as it impacts on considerations of molecular recognition, the development of functional materials, the vexed question of homochirality, nanoscale effects of interactions at interfaces, biocatalysis and enzymatic catalysis, and applications in organic synthesis. Chirality related to biocatalysis and enzymes in organic synthesis. 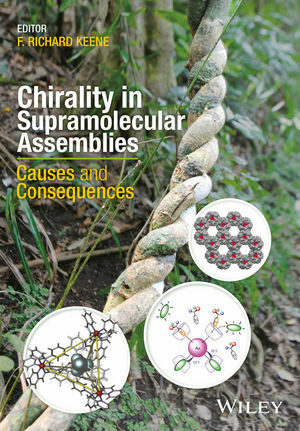 This book is a valuable reference for researchers in the molecular sciences, materials science and biological science working with chiral supramolecular systems. It provides summaries and special insights by acknowledged international experts in the various fields. Richard Keene is an acknowledged international authority on stereochemistry in coordination chemistry - and significantly, in the control of stereochemistry within polymetallic supramolecular assemblies - and has over the last decade has published widely on (i) its effect on intramolecular electron and energy transfer in such assemblies, and (ii) its influence on sequence- and structure-selectivity in the interaction of such complexes with nucleic acids, and their cytotoxicity to cancer cells and bacteria. He has over 160 publications (h-index 44), as well 6 chapters in monographs and a patent.